For many of us, the problem of overweight becomes less relevant in the fall than in the summer. No longer need to wear open dresses and T-shirts. A layer of excess fat on our body is easily masked by a coat and jackets. Therefore, with the arrival of cold weather, we relax. Stop thinking about diet. And in vain! Very soon it is time to choose an outfit for the New Year holidays. It is then that the pounds gained during the autumn months will be very, very inappropriate. And despite the fact that losing weight in the fall is incredibly difficult, nothing is impossible. At least you can keep your summer form. Or maybe even a little bit to build a winter. So, how to lose weight in the fall? If it is cold outside, overcast and to cope with a breakdown, is it possible only with the help of delicious food? In the autumn, a rich selection of fresh fruits and vegetables plays in our favor. Based on them, you can easily create a complete and tasty diet. Fresh vegetables and fruits are filled to the maximum with the life-giving power of nature. They contain the vitamins we need, micro and macronutrients. In addition, our body does not really need animal products in the fall. Instead, complex carbohydrates are recommended, which are found in vegetables, fruits, and cereals. A large amount of fiber has a very good effect on the body. It is found in foods of plant origin. Insoluble particles of plant fibers pass through the intestines. Clean the digestive tract from food debris. Thus, the purification and renewal of the gastrointestinal tract takes place. Fruits supply the brain with fructose. It helps to think quickly and correctly. Cereals give a large amount of energy. Thus, the correctly chosen autumn diet will not only help you lose weight. She is will help strengthen the immune system, avoid exacerbation of diseases. Also replenish the body with vitamins. The diet option that we offer you is very simple in execution. The diet menu is designed for 7 days. You can reduce your weight by 3-4 kg. But it is quite possible reduce and use in the form of fasting days 1-2 times a week. • Breakfast. Grated carrots with yogurt and 1 tsp honey; oatmeal drenched in kefir. • Lunch. 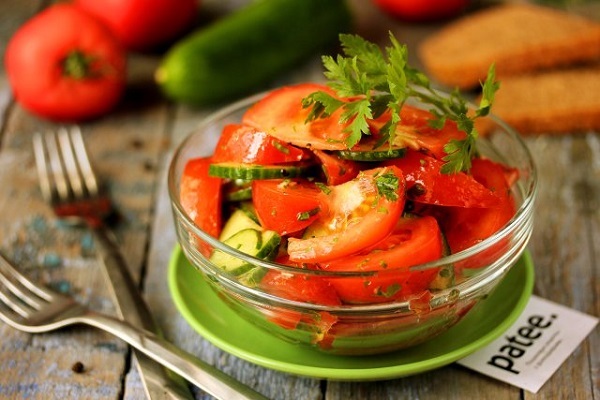 Salad of tomatoes, sweet peppers, onions and herbs with vegetable oil; 2 potatoes in uniform. • Tea time. Bell pepper. • Dinner. Salad from cabbage, carrots and apples with olive oil. • Breakfast. Grated roasted beets with parsley, prunes and nuts; slice of rye bread. • Second breakfast. An Apple. • Lunch. Rye cereal porridge; Sauteed eggplant. • Tea time. Two carrots. • Dinner. A bunch of dark grapes. • Breakfast. Cornflakes with yoghurt and 1 h. With a spoon of honey; salad of apples, pears, grapes and peppers with olive oil. • Second breakfast. 2 walnuts and 4 prunes. • Lunch. Sweet peppers stuffed with rice, carrots and eggplants; slice of whole grain bread. • Tea time. Two tomatoes. • Dinner. Baked pumpkin with nuts and honey. • Breakfast. Salad of seaweed with tomatoes, peppers, onions, herbs and vegetable oil; boiled brown rice. • Lunch. Sauteed eggplant, buckwheat porridge. • Tea time. Two bananas. • Dinner. Baked in foil eggplant with tomatoes, herbs and a spoon of sour cream; piece of rye bread. • Breakfast. Peking cabbage salad with bell pepper and vegetable oil; oatmeal on the water. • Second breakfast. Bunch of grapes. • Lunch. 2 potatoes in a uniform, baked beet salad with parsley, green onions, nuts and prunes. • Tea time. Two apples. • Dinner. Fresh cabbage salad with tomatoes. • Breakfast. Oatmeal with yogurt, grated apple and grapes. • Second breakfast. Orange and banana. • Lunch. Salad of green beans, tomatoes, sweet peppers, onions, garlic and greens. • Tea time. One Bulgarian pepper. • Dinner. Baked pumpkin with cinnamon and honey. • Breakfast. Buckwheat porridge and salad of baked beets with prunes, nuts and herbs. • Lunch. Peppers stuffed with vegetables and millet; slice of whole grain bread. • Dinner. Tomato salad; piece of rye bread.